This year, Oasys had the unique opportunity to cosponsor the Armed Services Arts Partnership’s Comedy Boot Camp Graduation Show. 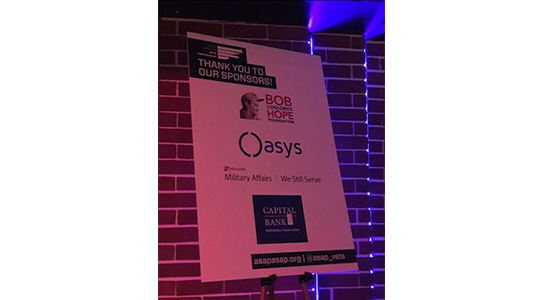 The show, held at the Washington DC Improv, was also supported by the Bob & Dolores Hope Foundation, Microsoft, and Capital Bank. The Armed Services Arts Partnership (aka ASAP) is a non-profit that provides introductory level arts classes: stand-up comedy, improvisational comedy, storytelling, creative writing, hosting open-mic events and creative workshops for veterans, service members, family members, and caregivers. Their inspiring mission is to bridge the divide between the civilian and military communities and help servicemembers reintegrate into the civilian community. One of the classes that ASAP provides is a seven-week course called ͞Comedy Bootcamp͟ that concludes the class series with a graduation show. At the show, the students perform their five-minute set they created over the course of the program. Talk about pressure! Comedy Bootcamp is the first-ever stand-up comedy class in the nation and has had notable performances at the Department of Veterans’ Affairs, Google, and the White House. The show this year did not disappoint! We laughed, we cried (we were laughing so hard) and we loved every minute! As a service-disabled, veteran-owned, small business, and a team comprised of 30% veterans, we felt this was a uniquely powerful cause to support. The Oasys team also had volunteers at the graduation show on April 25, 2018. We were impressed and inspired by how the performers executed their five-minute sets and look forward to additional opportunities to support this unique organization. To find out more about ASAP, please visit asapasap.org.